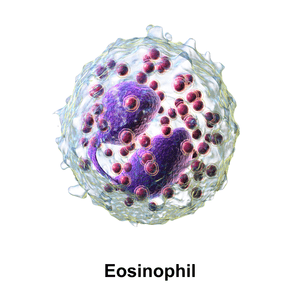 Eosinophils, sometimes called eosinophiles or, less commonly, acidophils, are a variety of white blood cells and one of the immune system components responsible for combating multicellular parasites and certain infections in vertebrates. Along with mast cells and basophils, they also control mechanisms associated with allergy and asthma. 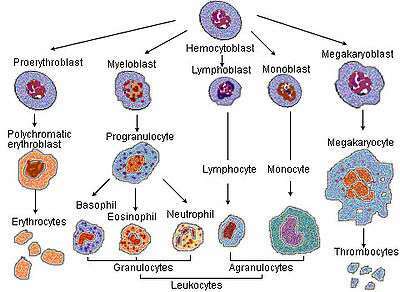 They are granulocytes that develop during hematopoiesis in the bone marrow before migrating into blood. These cells are eosinophilic or "acid-loving" as shown by their affinity to coal tar dyes: Normally transparent, it is this affinity that causes them to appear brick-red after staining with eosin, a red dye, using the Romanowsky method. The staining is concentrated in small granules within the cellular cytoplasm, which contain many chemical mediators, such as histamines and proteins such as eosinophil peroxidase, ribonuclease (RNase), deoxyribonucleases (DNase), lipase, plasminogen, and major basic protein. These mediators are released by a process called degranulation following activation of the eosinophil, and are toxic to both parasite and host tissues. In normal individuals, eosinophils make up about 1–6% of white blood cells, and are about 12–17 micrometres in size. They are found in the medulla and the junction between the cortex and medulla of the thymus, and, in the lower gastrointestinal tract, ovary, uterus, spleen, and lymph nodes, but not in the lung, skin, esophagus, or some other internal organs under normal conditions. The presence of eosinophils in these latter organs is associated with disease. Eosinophils persist in the circulation for 8–12 hours, and can survive in tissue for an additional 8–12 days in the absence of stimulation. Pioneering work in the 1980s elucidated that eosinophils were unique granulocytes, having the capacity to survive for extended periods of time after their maturation as demonstrated by ex-vivo culture experiments. reactive oxygen species such as hypobromite, superoxide, and peroxide (hypobromous acid, which is preferentially produced by eosinophil peroxidase). lipid mediators like the eicosanoids from the leukotriene (e.g., LTC4, LTD4, LTE4) and prostaglandin (e.g., PGE2) families. In addition, there are also eosinophils that play a role in fighting viral infections, which is evident from the abundance of RNases they contain within their granules, and in fibrin removal during inflammation. Eosinophils along with basophils and mast cells, are important mediators of allergic responses and asthma pathogenesis and are associated with disease severity. They also fight helminth (worm) colonization and may be slightly elevated in the presence of certain parasites. Eosinophils are also involved in many other biological processes, including postpubertal mammary gland development, oestrus cycling, allograft rejection and neoplasia. They have also been implicated in antigen presentation to T cells. An accumulation of eosinophils in the nasal mucosa is considered a major diagnostic criterion for allergic rhinitis (nasal allergies). An increase in eosinophils, i.e., the presence of more than 500 eosinophils/microlitre of blood is called an eosinophilia, and is typically seen in people with a parasitic infestation of the intestines, collagen vascular disease (such as rheumatoid arthritis), malignant diseases such as Hodgkin's disease, extensive skin diseases (such as exfoliative dermatitis), Addison's disease, reflux esophagitis (in which eosinophils will be found in the squamous epithelium of the esophagus), eosinophilic esophagitis, and with the use of certain drugs such as penicillin. But, perhaps the most common cause for eosinophilia is an allergic condition such as asthma. In 1989, contaminated L-tryptophan supplements caused a deadly form of eosinophilia known as eosinophilia-myalgia syndrome, which was reminiscent of the Toxic Oil Syndrome in Spain in 1981. ↑ Young, Barbara; Lowe, joseph o'connell; Stevens, Alan; Heath, John W. (2006). Wheater's Functional Histology (5th ed.). Elsevier Limited. ISBN 0-443-06850-X. ↑ Young, Barbara; Lowe, James S.; Stevens, Alan; Heath, John W. (2006). Wheater's Functional Histology (5th ed.). Elsevier Limited. ISBN 0-443-06850-X. ↑ Metcalf D, Begley C, Nicola N, Johnson G (1987). "Quantitative responsiveness of murine hemopoietic populations in vitro and in vivo to recombinant multi-CSF (IL-3)". Exp Hematol. 15 (3): 288–95. PMID 3493174. ↑ Metcalf D, Burgess A, Johnson G, Nicola N, Nice E, DeLamarter J, Thatcher D, Mermod J (1986). "In vitro actions on hemopoietic cells of recombinant murine GM-CSF purified after production in Escherichia coli: comparison with purified native GM-CSF". J Cell Physiol. 128 (3): 421–31. doi:10.1002/jcp.1041280311. PMID 3528176. ↑ Yamaguchi Y, Suda T, Suda J, Eguchi M, Miura Y, Harada N, Tominaga A, Takatsu K (1988). "Purified interleukin 5 supports the terminal differentiation and proliferation of murine eosinophilic precursors". J Exp Med. 167 (1): 43–56. doi:10.1084/jem.167.1.43. PMC 2188821 . PMID 3257253. ↑ Wagner LA, Christensen CJ, Dunn DM, et al. (June 2007). "EGO, a novel, noncoding RNA gene, regulates eosinophil granule protein transcript expression". Blood. 109 (12): 5191–8. doi:10.1182/blood-2006-06-027987. PMC 1890841 . PMID 17351112. ↑ Trulson A, Byström J, Engström A, Larsson R, Venge P (2007). "The functional heterogeneity of eosinophil cationic protein is determined by a gene polymorphism and post-translational modifications". Clin Exp Allergy. 37 (2): 208–18. doi:10.1111/j.1365-2222.2007.02644.x. PMID 17250693. 1 2 Hogan S, Rosenberg H, Moqbel R, Phipps S, Foster PS, Lacy P, Kay AB, Rothenberg ME (2008). "Eosinophils: Biological Properties and Role in Health and Disease". Clin Exp Allergy. 38 (5): 709–50. doi:10.1111/j.1365-2222.2008.02958.x. PMID 18384431. ↑ Lacy P (2005). "The role of Rho GTPases and SNAREs in mediator release from granulocytes". Pharmacol Ther. 107 (3): 358–76. doi:10.1016/j.pharmthera.2005.03.008. PMID 15951020. ↑ Saito K, Nagata M, Kikuchi I, Sakamoto Y (2004). "Leukotriene D4 and eosinophil transendothelial migration, superoxide generation, and degranulation via beta2 integrin". Ann Allergy Asthma Immunol. 93 (6): 594–600. doi:10.1016/S1081-1206(10)61269-0. PMID 15609771. ↑ Bandeira-Melo C, Bozza P, Weller P (2002). "The cellular biology of eosinophil eicosanoid formation and function". J Allergy Clin Immunol. 109 (3): 393–400. doi:10.1067/mai.2002.121529. PMID 11897981. ↑ Kato Y, Fujisawa T, Nishimori H, Katsumata H, Atsuta J, Iguchi K, Kamiya H (2005). "Leukotriene D4 induces production of transforming growth factor-beta1 by eosinophils". Int Arch Allergy Immunol. 137. Suppl 1 (1): 17–20. doi:10.1159/000085427. PMID 15947480. ↑ Horiuchi T, Weller P (1997). "Expression of vascular endothelial growth factor by human eosinophils: upregulation by granulocyte macrophage colony-stimulating factor and interleukin-5". Am J Respir Cell Mol Biol. 17 (1): 70–7. doi:10.1165/ajrcmb.17.1.2796. PMID 9224211. 1 2 3 4 Rothenberg M, Hogan S (2006). "The eosinophil". Annu Rev Immunol. 24 (1): 147–74. doi:10.1146/annurev.immunol.24.021605.090720. PMID 16551246. ↑ Shi H (2004). "Eosinophils function as antigen-presenting cells". J Leukoc Biol. 76 (3): 520–7. doi:10.1189/jlb.0404228. PMID 15218055. ↑ Gleich G, Adolphson C (1986). "The eosinophilic leukocyte: structure and function". Adv Immunol. Advances in Immunology. 39: 177–253. doi:10.1016/S0065-2776(08)60351-X. ISBN 9780120224395. PMID 3538819. ↑ Slifman N, Loegering D, McKean D, Gleich G (1986). "Ribonuclease activity associated with human eosinophil-derived neurotoxin and eosinophil cationic protein". J Immunol. 137 (9): 2913–7. PMID 3760576. ↑ Zheutlin L, Ackerman S, Gleich G, Thomas L (1984). "Stimulation of basophil and rat mast cell histamine release by eosinophil granule-derived cationic proteins". J Immunol. 133 (4): 2180–5. PMID 6206154. ↑ Morgan R, Costello R, Durcan N, Kingham P, Gleich G, McLean W, Walsh M (2005). "Diverse effects of eosinophil cationic granule proteins on IMR-32 nerve cell signaling and survival". Am J Respir Cell Mol Biol. 33 (2): 169–77. doi:10.1165/rcmb.2005-0056OC. PMID 15860794. ↑ Young J, Peterson C, Venge P, Cohn Z (1986). "Mechanism of membrane damage mediated by human eosinophil cationic protein". Nature. 321 (6070): 613–6. Bibcode:1986Natur.321..613Y. doi:10.1038/321613a0. PMID 2423882. ↑ Venge P, Byström J, Carlson M, Hâkansson L, Karawacjzyk M, Peterson C, Sevéus L, Trulson A (1999). "Eosinophil cationic protein (ECP): molecular and biological properties and the use of ECP as a marker of eosinophil activation in disease". Clin Exp Allergy. 29 (9): 1172–86. doi:10.1046/j.1365-2222.1999.00542.x. PMID 10469025.